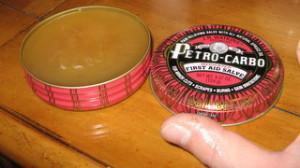 I love the J.R. Watkins Petro-Carbo Medicated First Aid Salve. It works great on cuts, scrapes, burns, bee stings, bug bites, and skin irritations. We purchased a 4.37 ounce container a year or two ago and still use it today. In fact, that one container will probably last our family several years. I have dry skin on the edges of my fingertips and thumbs. Sometimes I pick at it, and they end up bleeding. When this happens, I add some of the Petro-Carbo salve and they are healed in no time. I took a picture so you could see what I’m talking about. I even burned my hand once while cooking dinner for my wife. I ran to the medicine cabinet and put on some Watkins Medicated Petro-Carbo First Aid Salve and felt immediate relief. The suggested retail price is $12.99 per can. If you do some price shopping online, you can get a can for about $7. After doing a price comparison to other first aid salves at the local drug store, I can tell you that this product is priced competitively. Let me tell you, it’s worth every penny you pay for it. Sure, you can buy something cheaper, but I doubt you will find a much higher quality product than this one. If you haven’t already tried the J.R. Watkins Petro-Carbo Medicated First Aid Salve, you should. You can visit the company’s website and order a container. You won’t regret it. If you have a good testimonial about the product I would love to hear from you. Please tell us what you like or dislike about it and what you use it for. Leave a comment to share your story. Disclaimer: I am NOT affiliated with the company in any way. Watkins is a registered trademark. This page is in no way affiliated with the official company website. Sounds very similar to the salve I use for such things, but a sight less expensive! I may have to look it up and check the ingredients out. The one we use is called B&W Salve, which stands for Burn and Wound. It’s a honey-based salve with several healing herbs. My husband burned himself badly on something he had just welded, but after a week with B&W, he didn’t even end up with a scar. If this JR Watkins Petro-Carbo Medicated First Aid Salve is as good as that, I’ll buy it! You should check it out. It really is good stuff. Even though I do not have the J. R. Watkins Medicated Petro-Carbo First Aid Salve, after this review, I may actually go to CVS or Walgreens and buy this product. Or better yet, I will probably do my research to see it I can get it for less than retail value. Target has it for sale, along with a few other stores, but your best bet is probably Amazon or eBay.